To celebrate Global Entrepreneurship Week, we asked some of our app partners from all over the world to share the highs and lows of their experience with aspiring entrepreneurs of the future. Today we speak to Kim Ford, CEO of ServiceM8, whose field service app is lightening the load for tradies across the globe. 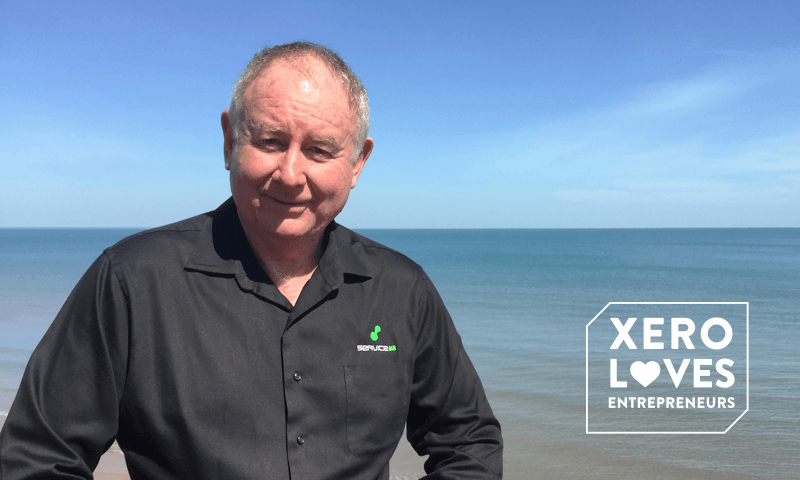 Ten years ago, after working most of his life in the corporate world, Kim Ford started looking at retirement and returned to Darwin from Melbourne, ready to slow down and unwind. But it wasn’t long before he felt a hankering to return to the business world. He’s not alone. Xero’s Ageless Entrepreneur report found, over half (60.1%) of corporate workers still dare to dream and have realistic plans to be their own boss in the interval before they fully retire. “I got bored very quickly and bought a local locksmith business with my middle son. After about four weeks, I realised that our small business couldn’t ever get ahead with the systems that were in place. So I tried to find something that would help, but I couldn’t find anything,” said Kim. He knew there had to be an easier way. With the help of another son, he set out to build an app that any tradie could use. It took about three years from conception to launch. In 2010 the team launched ServiceM8, which combines Kim’s two passions, business and technology. Xero’s study found that the greatest drivers for mature entrepreneurs starting their own business are meeting their career or life goals (83.5%) and pursuing their passions (80.9%). Kim agrees, and says hearing the stories of how ServiceM8 has changed people’s lives continues to fuel his passion day after day. Our report also found starting a business at an older age is perceived to have its benefits. These include greater life experience (77.7%), greater appreciation of personal strengths and weaknesses (58.3%), and being in a better financial position (51.5%). Thanks to technology and cloud based tools, it’s never been easier for older entrepreneurs to chase their dreams. Our study showed the over ninety percent (92.4%) of older respondents believe that technology will play a greater role in the success of older entrepreneurs. Kim says no matter how old you are or how long you’ve followed a certain career path, it’s never too late. He adds there’s nothing in the world that beats the job of being your own boss. The post How a Darwin retiree’s app became the tradies’ new best mate appeared first on Xero Blog.